This post is part of our “Transitions” Series, which highlights the experiences of recent graduates and early career archivists. If you are an early career archivist (0-5 years in the field) who would like to participate in this series, please contact us. I’m currently Associate Director of the Archives at Berklee College of Music, nearing my five year anniversary as a professional archivist. As one of the first two SNAP Year-in-the-Life bloggers back in 2012, I documented my first year on the job, as a grant-funded project archivist charged with establishing Berklee College of Music’s archives and records management program from scratch. This entry was posted in Transitions and tagged early career, Sofía Becerra-Licha, transitions on October 11, 2017 by emilykintigh. This entry was posted in Year in the Life and tagged Berklee, new archivists, new employment, Sofía Becerra-Licha, year in the life on November 25, 2013 by Lisa H.
This entry was posted in Year in the Life and tagged Berklee, grant positions, Sofía Becerra-Licha, year in the life on October 15, 2013 by Lisa H.
What a difference (almost) a year makes! A lot of things have come together in the last few weeks and as I look back on the first 11 months, it’s both reassuring and semi-exhausting to review our progress. The biggest news is that we finally have shelving installed in our off-site storage space. I mentioned this back in July when the funding was approved and I was excited about it then, but I cannot emphasize enough how much of a game-changer this is. Here’s the before: an approximately 7’x9’ pile of boxes, albeit appearing slightly more disheveled than usual in this shot because we were pulling materials. Contrast that image with this shot: everything’s off the ground and better organized on wire shelving. Even including the action shot posted on Facebook, these photos obviously reflect only a small measure of the work involved in unloading the pallets, clearing the space, assembling the shelves, and then figuring out how to fit everything back on. It was truly a team effort and while it ended up taking at least twice as long as we’d originally planned, the end result is so very well worth it. There’s a lot of processing work still to be done, and the fact that we have to transfer items back and forth between off-site storage and our on-site work-room adds an extra set of logistics to the mix, but being able to readily assess things like extent at a glance already represents huge progress. Speaking of progress, two more finding aids are up online, from collections processed this summer: the Jerome Gross and Bert Henry papers on the Schillinger System (BCA-006) and the Lawrence Berk papers on the Schillinger System (BCA-007). In addition to gaining an additional work-study assistant, this semester we’re fortunate to have another Simmons GSLIS intern. Among other things, she will be creating a digital exhibit version of the Franklin McGinley collection on Duke Ellington (BCA-004). Finally, I’ve also started reaching out to the remaining academic departments to resume scheduling meetings to wrap up the records management survey this semester. We’ve received some more photographic materials, and just last week a photo from one of our collections was featured on the College’s Facebook page for Throwback Thursday. It was quite a hit! This entry was posted in Year in the Life and tagged Berklee, Collection Storage, Outreach, Processing, Sofía Becerra-Licha, year in the life on September 16, 2013 by Lisa H.
After being out all last week for SAA, I’m slowly easing back into the work routine. The annual meeting in New Orleans was my third, but this was definitely the longest and busiest SAA I’ve experienced. I attended a pre-conference workshop, presented at the pre-conference research forum, ended up helping out at another panel, and did my best to attend a variety of sessions. All of which made for an intense, but nonetheless rejuvenating, week. Back on the home front, I’ve returned to chipping away at accessions. In anticipation of hiring additional work-study students and being able to pass on some more basic processing tasks, I’ve been focusing on getting a better handle on a set of records maintained by Alma Berk, who was Berklee’s first publicity manager. I’m only a few boxes in and I can already tell this will be a challenging collection due to the variety of materials I’ve encountered so far. Among other things, I’ve come across painstakingly compiled scrapbooks of newspaper clippings and other publicity documenting the early years of the College, old course catalogs, more photographs, Schillinger House paraphernalia, and musical works by founding college president Lawrence Berk. Each time I open a new box I never quite know what to expect and it’s alternately overwhelming and an entertaining exposure to a wealth of Berklee trivia (depends on the day, and on what exactly turns up!). In other news, we’ve been working with campus administrators to start archiving master’s projects, beginning with Berklee’s inaugural class of master’s graduates on the Valencia campus last month. We’ve also drafted a records policy and set up a basic system to track researcher requests. Even though we’re not quite fully open, I think we’ve managed to do a pretty good job of fielding the reference questions that have come in. For example, we have: managed to track down early course catalogs to help rebuild an early student record; provided photo reproductions for a student production and another department’s electronic press kit; assisted a local independent scholar in locating and reproducing selections from the Berklee Oral History Project for use in a public symposium on the history of jazz in Boston; and provided filmmakers in Turkey with reproductions of materials relating to legendary producer and arranger Arif Mardin ’61 for an upcoming documentary. Although at times it can be challenging to handle researcher requests on top of all the workplan tasks, it’s also a great reminder of just how much this project is needed and how far we’ve already come in terms of being able to provide access to our archival holdings. This entry was posted in Year in the Life and tagged SAA 2013, SAA Annual Meeting, Sofía Becerra-Licha, year in the life on August 21, 2013 by Lisa H.
Greetings from Boston where, as usual, there’s plenty afoot here at the Archives. One significant responsibility lurking in the background throughout this period has been the second interim report due to the NHPRC at the end of the month. This one includes a financial component, so in addition to compiling a narrative write-up, as we did back in January, we’ve also been going through our records to make sure we’re on track to fulfill the terms of the grant. All in all, we look to be in good shape and putting all this information together has served as a helpful reminder of just how jam-packed the last six months have been. One exciting piece of news is that we were able to secure some funding from the College to purchase shelving to better store our off-site materials. This is huge because it means we will be able to make better use of the rented floorspace space and retrieve items much more easily. As expected, the pre-planning has involved a decent amount of research and comparison shopping to find a solution that’s the best compromise between the resources we have at hand and the archivally acceptable options out there. And I’m admittedly avoiding thinking too much about the installation process and all that will entail, particularly given the heat wave we’re currently experiencing. But these are fantastic “problems” to have and it’s quite heartening to see things coming together as they are. On the processing front, it’s turned out to be the summer of Schillinger. Our summer intern will be wrapping up her field experience this week and, as I’ve previously mentioned, she spent most of her time processing what we’re now calling the Lawrence Berk papers on the Schillinger System. Amid other projects, I also processed another small collection of Schillinger-related materials: the Jerome Gross and Bert Henry papers on the Schillinger System. This collection encompasses a correspondence course taken by Dr. Jerome Gross of Cleveland, OH and related notes and memorabilia created and compiled by authorized Schillinger instructor Bert Henry. As with Lawrence Berk’s notes, we were fortunate to have Phil DiTullio, director of the local Schillinger Society, come in and help us with the description for the finding aid, which is now complete and in line to be published online. Outside of my daily work, I’ve continued putting some thought into my ongoing professional development, as well as seeking ways to stay plugged into the professional community, particularly as a lone arranger. In addition to getting involved with the New England Music Library Association (NEMLA), I’ve also been involved with NEA’s nascent Roundtable for Early Professionals and Students (REPS) as a member of the administrative/bylaws committee. At the upcoming SAA annual meeting, I’ve signed up for Monday’s EAD hack-a-thon workshop and I’ll be presenting my master’s paper research on MPLP and audiovisual archives as part of the research forum on Tuesday. So already that second week of August is looking to be a busy one, but I’m really looking forward to catching up with friends and colleagues and experiencing the conference as a new professional. This entry was posted in Year in the Life and tagged Sofía Becerra-Licha, year in the life on July 22, 2013 by Lisa H.
Much like Emily, I’m finding June has come and (nearly) gone in the blink of an eye. Nevertheless, slowly but surely, we’re continuing to make progress on a variety of fronts here at Berklee. Processing continues to hum along, with my intern alternating between wrapping up the rehousing of the Alma Berk collection of photographs and processing Lawrence Berk’s notebooks on the Schillinger method of composition. More publicly, we recently published two new finding aids: for the Bobby Vince Paunetto papers and for the Franklin McGinley collection on Duke Ellington. Both collections posed some interesting challenges, albeit for different reasons. The Bobby Vince Paunetto papers include scores, sketches, papers, and sound recordings in reel, DAT, and compact disc formats, both published and unpublished. Paunetto graduated from Berklee in 1973 and was an innovative Latin jazz composer and musician. Despite being struck by Multiple Sclerosis in the prime of his performance career, Paunetto was able to return to writing music. His output was impressive: between 1985 and 1993 he wrote over 300 works and he recorded his fourth and fifth albums in the late 1990s. The Paunetto papers were a formidable challenge to process because of the sheer volume of scores (including many duplicates) and an absolute lack of discernible original order. Fortunately, my student assistant was a huge help in foldering the papers and creating an inventory so that hopefully it’s a much more manageable set of materials to navigate. But even at a relatively minimal level of processing, it was a bit of a slog. By contrast, the Franklin McGinley collection on Duke Ellington was much more straightforward, in terms of scope and cubic footage. 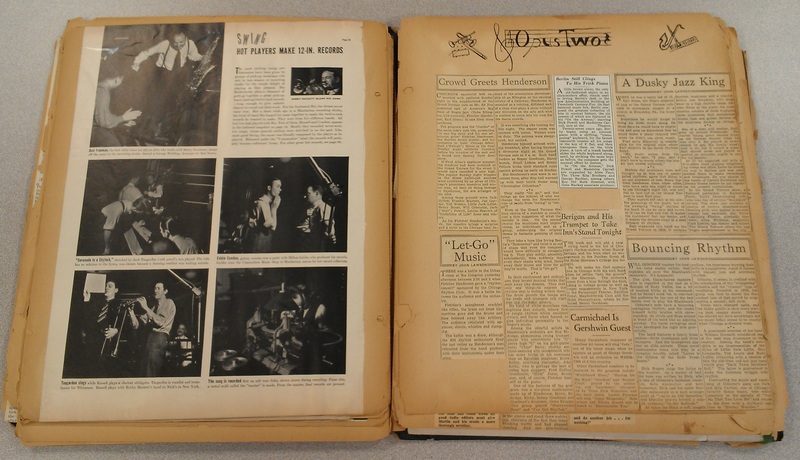 This considerably smaller collection consists of clippings, commemorative materials, and a scrapbook documenting the rise of swing music and, in particular, Duke Ellington’s career and legacy. The scrapbook includes artwork and many musician autographs. Notable signatures include Roy Eldridge, Coleman Hawkins, Louis Armstrong, Harry Carney, and an extremely rare Jimmy Blanton. The items in the McGinley collection came to us in two stages. The scrapbook (pictured above) arrived first, and for all the painstaking illustrations, it lacked any identifying information or accompanying documentation on the donor. So as I drafted an initial finding aid, all I knew was that it had been donated by a Berklee faculty member years ago. Fortunately, the same (now retired) professor returned relatively recently with more materials from the same individual (loose clippings and other memorabilia). Although we now have a name, Franklin McGinley, that’s about all I know about the creator. Moreover, the scrapbook is falling apart, many of the clippings are brittle, and most items in the final section are loose. So there’s further preservation work to be done (we’re aiming to scan the scrapbook in the near future). In many ways this collection feels more like a work-in-progress than a finished product, but what doesn’t in an archives? In addition to encoding these finding aids, as always, I’ve been doing my best to chip away at sundry tasks. I spent some time catching up on accessions. Now that I’m more settled and on my second intern, I’ve also taken the opportunity to revise and create some additional processing documentation, including checklists for creating accession records and finding aids. I’m particularly mindful that we’re nearing the mid-point of our grant and, as such, I’ve been reviewing our workplan and interim narrative to make sure we’re in good shape for the more substantial NHPRC report due at the end of July. This entry was posted in Year in the Life and tagged Berklee, Sofía Becerra-Licha, year in the life on June 24, 2013 by Lisa H.